In our business processes are our UI procedures more and more characterized from heterogeneity. You have to handle one activity in a desktop application, another in a web browser and another one in the SAP GUI for Windows. Also it could be possible that all these different UI activities affect one business process. Most of these processes contains repetitive steps and are therefore good candidates for automation. But it isn’t easy to handle those different kind of applications in one automation solution. Here I described an automation approach on the base of different open source and freeware components. 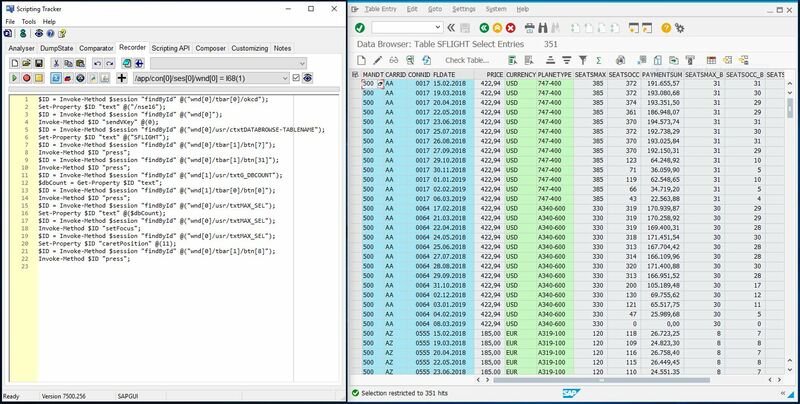 In this post I will show an example how to handle the combination of SAP GUI Scripting with Web Dynpro, based on this approach. You can find here another approach to combine SAP GUI Scripting with Selenium WebDriver. There I used other programming languages and tools. Divergent to this approach I use instead of Selenium IDE for Firefox now Katalon Automation Recorder Chrome Extension. 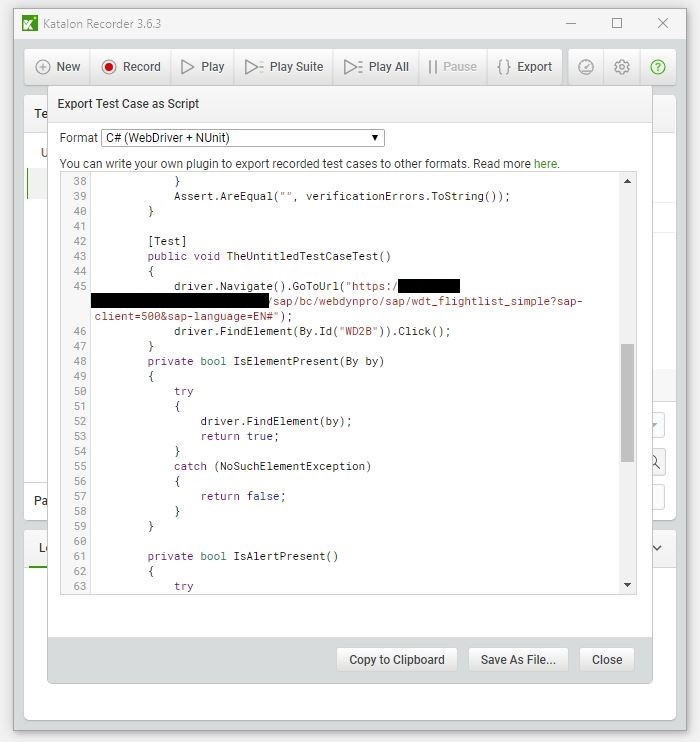 This is a Selenium IDE compatible recorder for Chrome and Firefox. We start with the installation of Katalon Automation Recorder. Open the Chrome web store and enter katalon automation recorder, choose add and a few seconds later you will see a tiny K icon on the top right. If you press on it an additional window will open, the Katalon Recorder. The following example is not a meaningful process. It should only clarify the procedure. 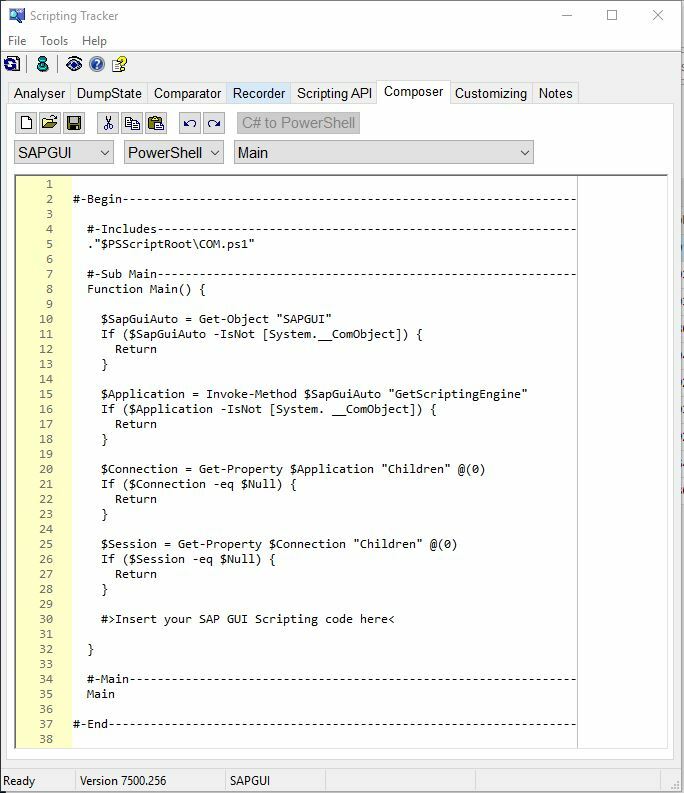 At first we begin with the recording of an activity in the SAP GUI for Windows. We open SE16, open the table SFLIGHT, read the number of records and open the table. …and to press the search button. Now we export the code in C#. All preparations are done now. In the next steps we compose now our snippets to one solution. 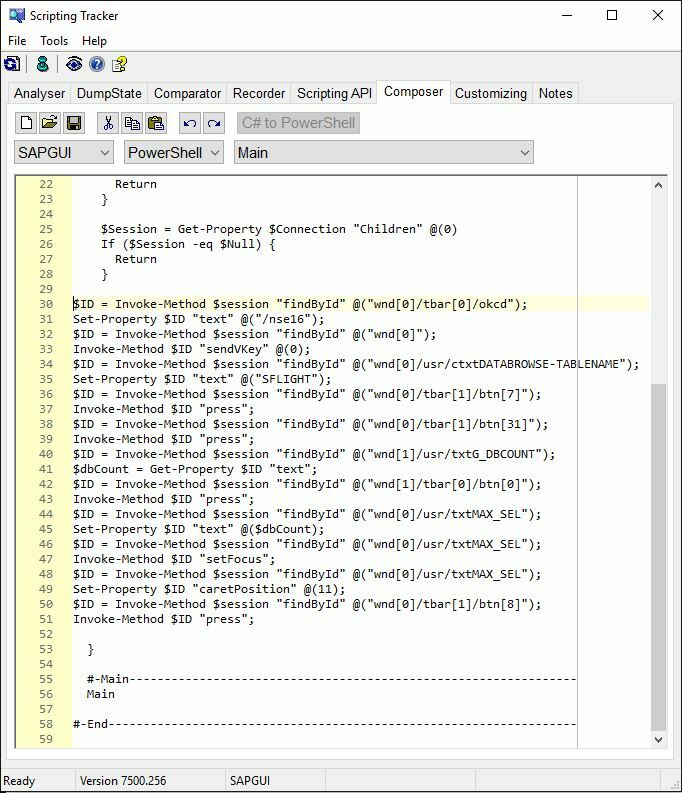 We open the Composer and choose SAPGUI with PowerShell. We add the Main procedure. 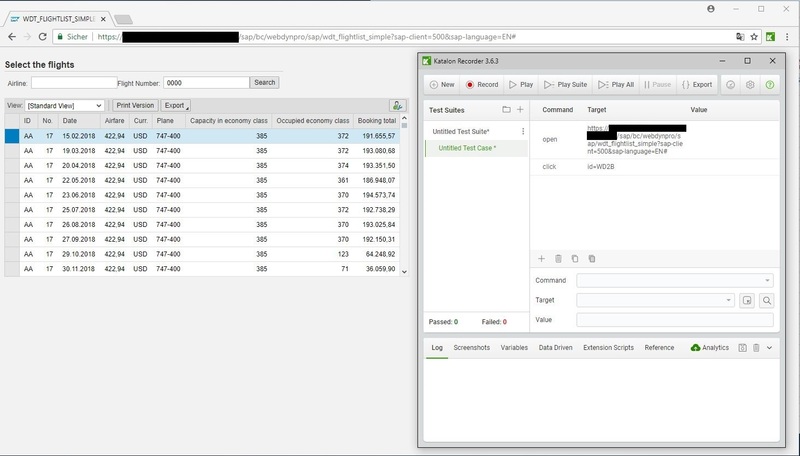 We add our recorded SAP GUI Script. Now we switch to Web and add Sub LoadSelenium procedure. Also we add OpenChrome procedure and WaitUntilComplete procedure. Now we complete our code with OpenChrome and the URL. We mark the sequence of commands from Katalon recorder and press the C# to PowerShell button. 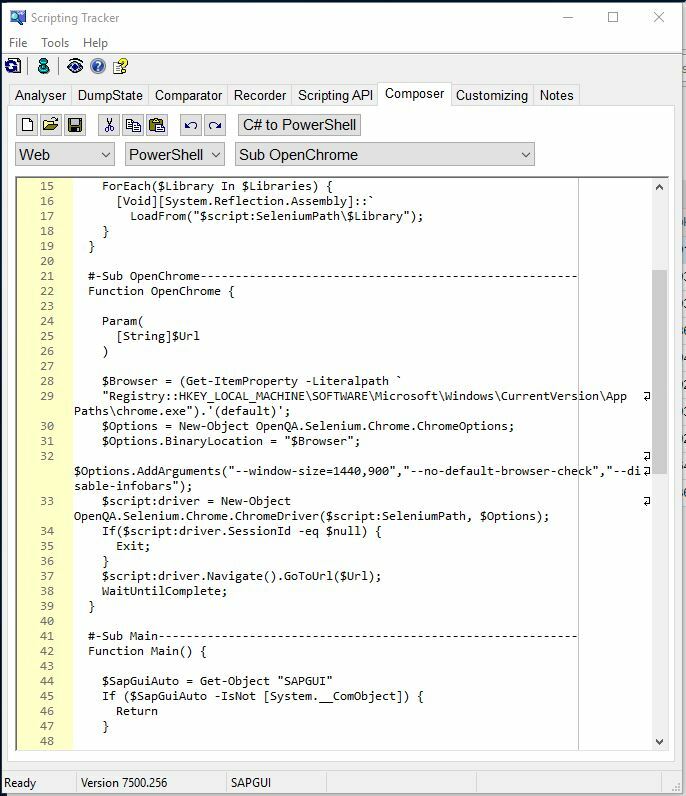 Now the lines will change from C# to PowerShell code, in our case only one. Now the composing is complete. 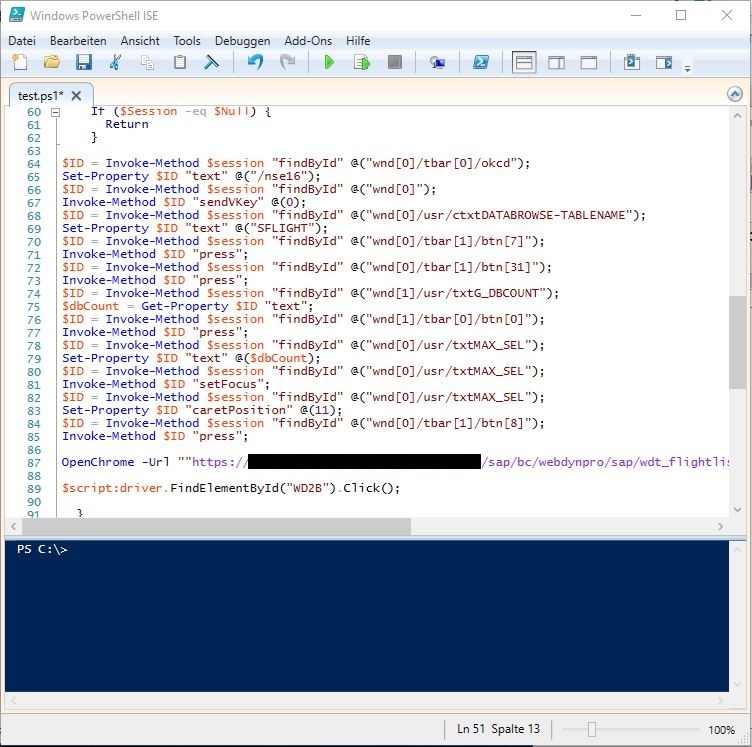 The file can be saved, opened and executed in the PowerShell ISE. With the combination of Scripting Trackers Recorder and Composer, as well as the Katalon Automation Recorder, you can easily create cross application automation solutions in SAP context. It is like a puzzle and sometimes it isn’t easy to find the correct pieces. And, maybe a little bit paradox, each piece can be used independently from the other. This is an more or less abstract example, I use exactly this approach for test automation of SAP processes in our online office. And more is possible. You can also combine AutoIt to automate desktop applications or you can integrate mobile devices into your testing scenario. 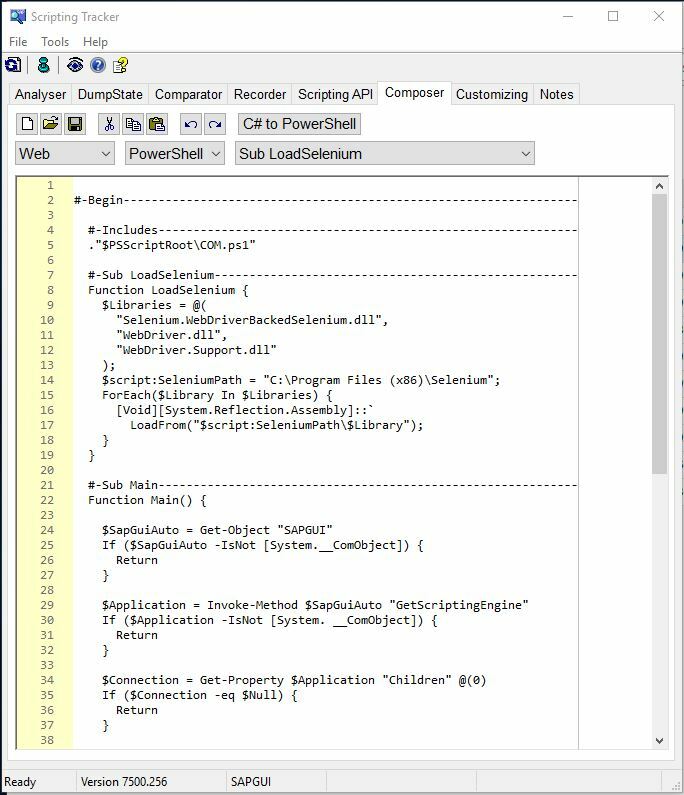 Last but not least here a PowerShell script to automate a UI5 application, which can also be used in this context.